The history of Fujitsu air conditioners dates back to 1962 when Fujitsu General Limited was producing for Japan's domestic market. By 1984, Fujitsu air conditioners are already exported worldwide with factories set up in various countries to cater for the growing demands for Fujitsu air conditioners as well as ensuring products remain its superb quality. Commited to produce Quality, Energy Saving, Environmentally Friendly and Healthy products, stringent Japanese quality control personnel refuse to deliver sub standard products or compromise on quality and reliability for the sole purpose of cost reduction. 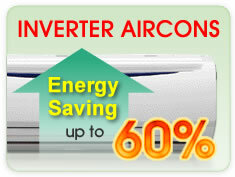 And it it due to this persistence, many consumers have enjoyed Fujitsu's energy saving air conditioners. In Malaysia, Fujitsu General Limited has appointed FE Denki Sdn. Bhd. as the sole agent to handle the aspects of sales, marketing and after-sales support for Fujitsu air conditioners to cater closely to the needs and requirements of local consumers. The dedication and expertise of personnel at FE Denki coupled with the fabulous product, ensures satisfaction guaranteed for every Fujitsu air conditioner user.